Black teenage mothers are still some of the most misrepresented and stereotyped people in the U.S., and those negative images have only been perpetuated on the big screen. Which makes a documentary like FOR AHKEEM that much more intriguing as it reportedly tells the story of a 17-year-old St. Louis girl who's forced to navigate her own humanity as a young black woman coming into her adulthood and early motherhood during the Black Lives Matter movement and in the aftermath of 18-year-old fellow Missourian Michael Brown's senseless murder at the hands of police. 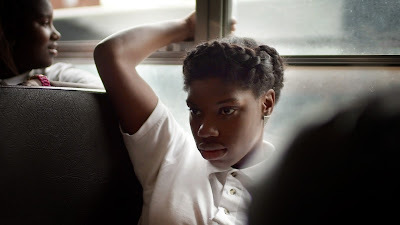 From award-winning directors Jeremy S. Levine and Landon Van Soest, FOR AHKEEM is the moving portrait of 17-year-old Daje Shelton, a Black girl in North St. Louis, as she navigates the many challenges of growing up in inner city America with one goal: to graduate high school. Filmed over a three year period, we watch as Daje struggles against countless obstacles to obtain her high school diploma, her only hope of a better future, while navigating life as a teenager in America. The camera quietly follows her as she experiences her first love and explores a challenging new role as a teen mother. Despite the daily struggle to maintain focus in school and graduate, Daje and her family show the strength, resilience, and determination it takes to survive.